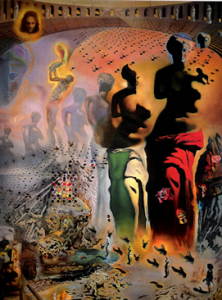 One of the most impressive and memorable aspects of Salvador Dali’s art was his absolute mastery of double-imagery. 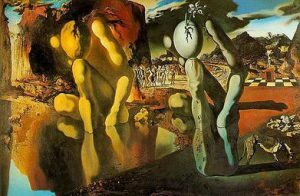 I’m not sure any artist in history did it as well as Dali did. 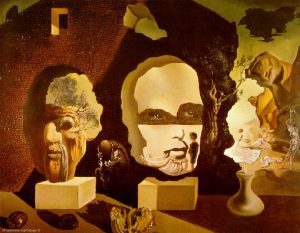 This, of course, is when a painted object or scene becomes, at the same time, something entirely different – depending on how your brain shifts your visual perception from “A” to “B” and back again. 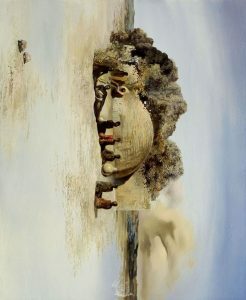 Dali simply loved this kind of illusion. He was a magician with a paint brush! 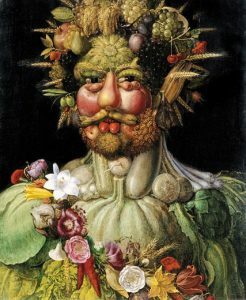 Probably the most well-known champion of double-imagery painting from art history was Giuseppe Arcimboldi, who did a good number of paintings like this one, where fruits and vegetables and other mainly food items converged to form portraits. 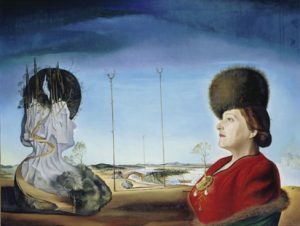 Double-imagery very much accorded with Dali’s Paranoiac-Critical creative method, because true paranoids actually do often perceive double images and multiple meanings in things around them. 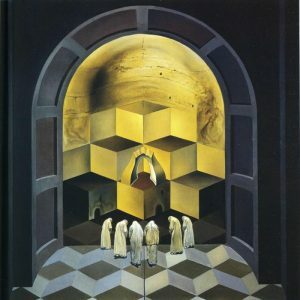 Dali was able to conjure up such images in the way he viewed and perceived most everything – and then transcribe his visions (that’s the “critical” part of the Paranoiac-Critical method) onto canvas (or print matrix, paper, copper plates, whatever) so that we, too, could share in his optical experience. 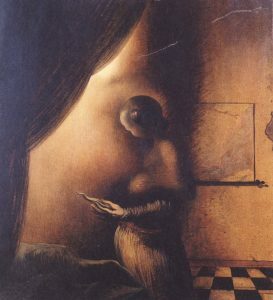 I believe his first important double-image painting was The Invisible Man. It was an ambitious and complex oil painting, and the appearance of a seated man among the various elements came off quite successfully. 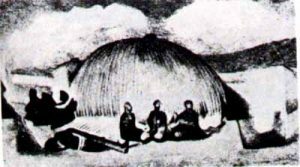 Another early and fascinating effort was the photo of an African hut scene, which, when repositioned a quarter turn, offered up for Dali the appearance of a face. He worked it beautifully to show us what indeed looks like a woman’s face. 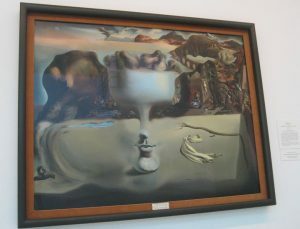 A skull theme informed three distinct double-image pictures by Dali, seen here. 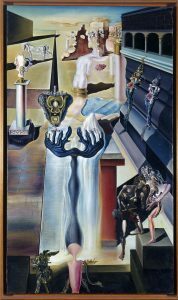 One was Café Skull, the other a poster design commissioned by the U.S. government to warn servicemen about the evils of venereal disease, and the third is the magnificent oil, Skull of Zurbaran – the only Dali gem gracing the Hirschhorn Museum in Washington, D.C.
Portraiture plays a role in several Dali double-images, too. 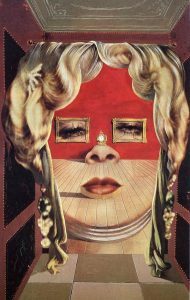 One is the iconic work, Portrait of Mae West, Which Can Be Used as a Surrealist Apartment. 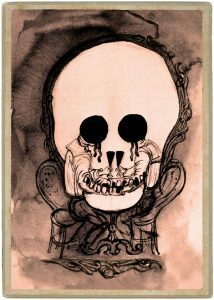 The framed pictures on the wall become the eyes of Ms. West, with the fireplace somewhat unflatteringly representing her nostrils, and the lips sofa that also spawned an actual sofa of this shape. 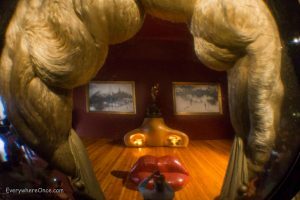 Years later this theme would find itself the center of attention as the Mae West Room in the Teatro-Museo Dali in Figueres, Spain. 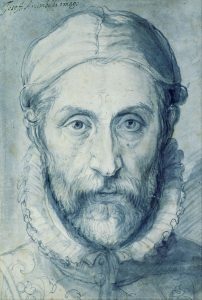 In the picture, below left, a bowed woman, derived from Vermeer’s Girl Reading a Letter, is at the same time part of what makes up a profile of a bearded man. 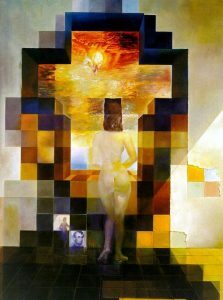 Abraham Lincoln emerges out of a multiplicity of colored cubes, while Dali puts a slightly different twist on the double-image technique in his commanding and clever “double-portrait” of Isabel Styler-Tas. 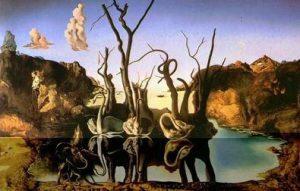 Dali employed his double-imagery genius in the canvas, Old Age, Adolescence and Infancy, and more elegantly in the great Swans Reflecting Elephants. 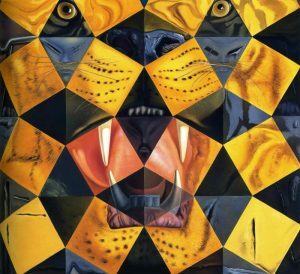 Dali’s Royal Tiger (I’m using the shortened title) presents us with a composition of cubes – not unlike the Lincoln and Zurbaran works previously discussed – but this time they roar with the macro-image of a Bengal tiger. 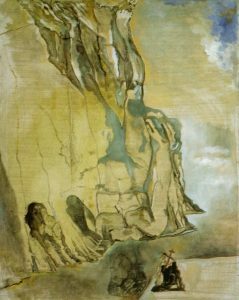 Two of the most important paintings ever by Dali pivot around tremendous double-image talent: The Endless Enigma – in which a dog, guitar, fruit dish, face, and horse, are hidden yet seen – and Apparition of Face and Fruit Dish on a Beach. Do you see the large dog? There are other elements to detect, as well. 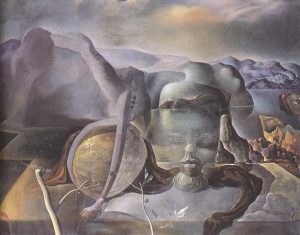 Dali paintings can sure be fun! 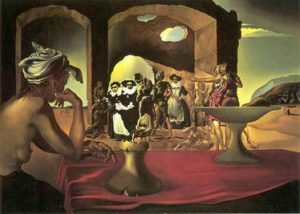 Without any doubt in my mind, the three most important double-image paintings ever created by Salvador Dali happen to be three of the most famous works he ever created: Metamorphosis of Narcissus, Slave Market with Disappearing Bust of Voltaire, and The Hallucinogenic Toreador. If you don’t know about the double-images in these three masterpieces, you’re probably not interested in this blog — and therefore you’re probably not here! 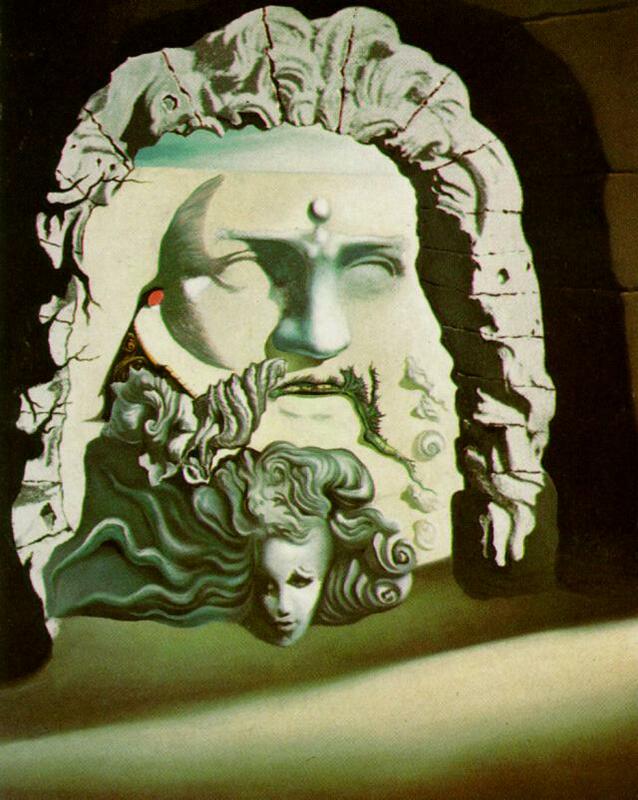 Finally, here’s a dandy Dali double-image from his animation project, Destino, with Walt Disney Studios; and the late in life work, Landscape with Hidden Image of Michelangelo – definitely a slightly different take on Dali’s more typical double-image approach (turn it upside down!). Of course, there are others. But I think this helps us remember (as if we could forget!) that among many things, Salvador Dali will always be respected as the artist who mastered double-imagery probably better than anyone else.